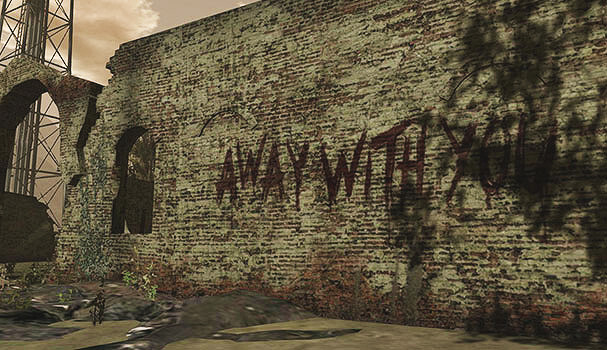 Outbreak is a post-apocalyptic, horror, and survival-themed role-play community in Second Life. Our story is set in modern-day times, 1594 days after an unknown contagion spread across cities, and now focuses on the struggle of survivors that struggle to cope with the destruction of life they once knew. While Outbreak is classified as zombie genre for role-play destinations, unlike most, we are NOT a shooter / combat sim. Players are required to follow the text-based role-play guidelines and is supplemented by our very own Survival HUD that tracks basic necessities for survival like hunger, thirst, sickness, as well as bullets and money. The Infected (zombies) that appear will not chase you or require prim bullets to take down – instead, when they appear, you may interact with them should you choose and make decisions based on dialog menus that are presented (classic RPG style). Your choices will impact your survival and it is up to you on how you role-play them into your scenes. Interacting with the Infected is optional; there is no penalty for choosing to “Flee”. Our story sets place on a barrier island off the northern coast of California called Arklay. Survivors likely arrived by bridge or boat to escape the hordes of Infected that roam freely on the mainland. After settling into makeshift homes, those who inhabit the Island banded into various groups, trade commodities for survival and comfort, and provide various services to one another to simply get by. The city center is under the protection of the council, a group of survivors who run various businesses and have an interest in keeping the cash economy afloat. The rest of the island is considered the Fringe and home to those who thrive without laws and operate criminal activities. As days go by, resources become scarce – from clean water, fuel for generators, to edible goods, survivors have banded together to run businesses and form tight-knit communities. Economy on the island still includes cash, but as various resources run out, trade of commodities like canned goods and bullets become just as valuable. Your choices on the island, from earning your keep by working jobs in businesses, trafficking commodities on the island, to attacking other characters will impact the traits you chose. Will you choose to fight for humanity? Or will you choose to fight only for yourself … the decision is yours. Regular, dirty, to worn modern-day clothing works. Think about the things you’ll likely raid at an abandoned Walmart – hiking apparel and moderate protection. Tactical gear (ie. kevlar, gas masks, etc.) is highly discouraged. Not only is it unnecessary on an island protected from the hordes, but is a common powergaming issue in fight scenes. Don’t be THAT kind of player. Firearms are restricted to the ones we provide through trade or scavenging. These firearms come in a variety of types and models and are used in various features of Outbreak including hunting animals for resources, player-vs-player combat scenes, and dispatching the non-player character (NPC) hostiles like the Infected. Firearms bought elsewhere in SL may be worn on your character if it closely resembles the official firearm you’ve acquired. Just remember to wear the official one so it remains active on your HUD and leave it invisible by holstering it. Melee weapons require creative thought; everyday items like a shovel, meat cleaver, kitchen knives, to baseball bats are great examples. That decorative katana that looks really cool is more likely to be a “made-in-China” fake and would break in a few strikes against flesh and bones – keep that in mind! Fight scenes between players require text-based role-play and the outcome may be predetermined using a special PVP feature (that red button on the Survival HUD) to ensure fairness by taking into account your character’s traits, experience on sim, active weapon, available ammo, hunger, thirst, sickness, and health… and of course, a bit of chance. Remember, fights are not about winning or losing. It’s always about furthering your story – it opens up role-play opportunities by creating rivalry, the need for treatment from hospital staff, and more. To survive, your character can acquire edible commodities by looting the corpse of the Infected, trading with other characters, earning weekly pay at a local business, hunting animals, to scavenging across the island. I’m here, I’m dirty, and I got me a big ol’ shovel. What do I do now? Arklay Island is your character’s salvation from the hordes, the raiders, and the elements. It has become home to most and a trading hub for those who pass through. First, you must create your character and receive an invitation to the Outbreak Roleplay group in-world. You can do so by reading the role-play guide first and following the instructions outlined there. Once you’ve been accepted, get a copy of the HUD in the Welcome Area and use it to track basic survival needs. Use the cash or items you begin with to trade at local businesses or other characters for food and water. Scavenge the dumpsters and fight the Infected to find loot and cash, too! You can also jump right into role-play by learning about the various businesses and jobs offered, earn some money, or even attempt to join a specific band of survivors (faction). The hospital features a shelter designed to get your character integrated onto the island, too. I want to read the rules and create my character!